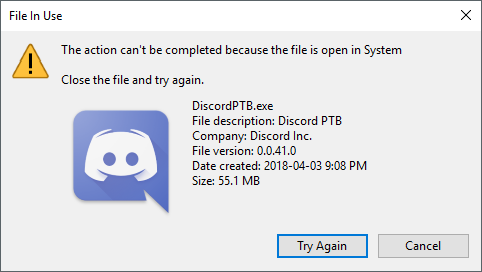 Close Discord from the system tray. Click "Try Again" in the "File In Use" window shown in the screenshot above. The file will successfully rename. The UWP sandbox does not allow us to access files like this directly. The location dialog should use an IE control - I do not know how that works because I am only using the one built into Windows. Does this happen in a f.lux session if there is no map shown? @herf The issue of the topic does not occur if a location has not been setup with f.lux. On a fresh f.lux install, the location dialog will popup. I can rename exes in AppData freely while the location dialog is up at that state. When I enter a location and click OK for f.lux to start working, that's where things go wrong. thanks - I will look into it. @herf were you able to reproduce the issue? if you weren't, I can try and reproduce it in a VM for you.